At In-the-Spirit, we love all cocktails – classic, contemporary and downright unusual. As long as they have the all important ‘Mmmm’ factor, we’ll give them a try! 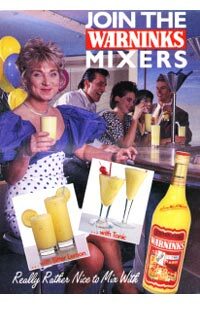 We’ve rediscovered the delights of Warninks Advocaat – the original cream liqueur popular as a cocktail ingredient back in the 1970s and 80s when anyone who was anyone wouldn’t dare to be seen without a perm, white patent shoes and a Warninks Cocktail. It was so popular, in fact that a little known brand called Bailey’s was launched to try and muscle in on its’ unrivalled success. And of course, Christmas just wouldn't be the same without a Snowball.